FAQ: Are there Fewer Hummingbirds this Year? Q. I'm not seeing many hummingbirds? Are there fewer hummingbirds around this year? A. We will always see fluctuations in the number of hummingbirds coming to feeders in some portion of North America every year. 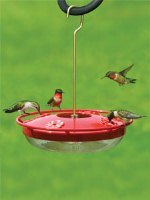 But based on past experiences and the lack of any reports of "catastrophic" events that would have effected hummingbird populations, we believe the lack of activity you might be experiencing at your feeders is most often tied to weather and it's impact on the abundance and quality of the plants that provide natural nectar sources. In areas experiencing prolonged, multiple year drought, we have seen much reduced activity at feeders as hummingbirds continue their migration to avoid areas that are almost completely devoid of nectar plants. They will not take a chance on nesting in areas with such extreme conditions. In contrast, once established on their breeding ground during a normal weather year, a short term summer drought seems to drive hummingbirds to feeders as their sources of plant nectar begin to dry up. Due to favorable weather conditions this year, the Eastern portion of the US has been experiencing one of its best growing seasons in years. The widespread abundance of nectar plants is providing a tremendous natural food supply for hummingbirds which reduces their activity at our feeders. It also allows them the advantage of being able to spread out their breeding territories into areas that may not have been able to support them in less favorable years. So there may be fewer hummingbirds at any given location than in previous years, but the overall population is stable...just distributed over a wider area. During the height of the nesting season, female hummingbirds are hard a work at the nest - incubating, brooding, feeding 1-2 nestlings. Throughout that process, we typically see a little less of the adult females. But that changes once the young fledge, when females and young make frequent visits to quality nectar sources. Make sure your feeders are clean and the nectar is fresh so that your feeders are amongst the nectar sources they choose to visit! The majority of this material was provided by WBU Chief Naturalist, John Schaust. 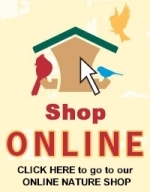 Seeing a Slow-down at your Hummingbird Feeders? Waxwings - Coming to a Parking Lot Near You! In an attempt to soften the look of parking lots, commercial developers often plant grass around the perimeter of the lot and drop skinny little grass islands along the traffic lanes. In these little slivers of grass, they will often plant small, low maintenance shrubs like junipers and yews. To provide height, ornamental crab apples are often planted in these little slivers of green. Crabapple trees provide color and interest in all four seasons and they can have a nice compact growth. They are relatively undamaged by insects and require little pruning. For these reasons, ornamental crabapple trees have been found to be ideal for these commercial applications. But while developers like the crabapples' compact growth and low maintenance, the birds like the fruits the trees bear. Crabapple fruit is always small, two inches in diameter or less. The fruits are borne in late summer and often remain on the trees well into winter. After the fruits have frozen and thawed, perhaps multiple times, they become especially attractive to fruit-loving birds like American Robins and Cedar Waxwings. Mixed flocks of these birds can descend on crabapples in great numbers and strip the remaining fruit within hours. Freezing and thawing breaks down the sugars in the fruits, which seems to make them more attractive. The robins and waxwings coexist nicely as they forage together on these compact trees. I thought I even saw a robin looking out for a waxwing - once, as I approached a waxwing, a robin flew up close to the waxwing as if to alert it to my approach! If the birds get spooked from one tree, they just move on to the next. As the fruit on a tree gets cleared off, they move to the next tree. And when all the trees around one parking lot have been stripped, they'll move on to the fruit trees in the next lot, then the next, and so on. This makes it so easy to see Cedar Waxwings tossing down fruits and berries. If you don't have fruit-bearing trees in your yard, a parking lot, surprisingly, may be your best chance to get a close view of these handsome birds. So next time you go to the mall, or the grocery store, the doctor's office or even that fast food restaurant, check out the trees around the lot and you just might get the best deal in town there - a tree full of foraging waxwings and robins! It appears my resident male Ruby-throated Hummingbird has taken off on his migratory journey south. He fiercely protected the area under the plum tree, keeping other hummingbirds off the 1-2 feeders that hung there throughout the summer, as well as the Bee Balm and Cardinal flower beneath. In his absence, these nectar sources are now open to all, no longer guarded by the strong-willed Prince of the Plum Tree. Hummingbirds aren't born knowing to seek out red flowers. Each hummingbird must learn the association between each flower and quality food. Hummingbirds also have excellent memories, remembering the location of those great nectar sources, and they'll return to those flowers throughout the entire day as the nectar replenishes. I think we can learn something from this! Hummingbirds learn by trial-and-error which flowers are the source of the best quality food. They discover that plants like Bee Balm (Monarda), Coralbells (Heuchera hybrids), Scarlet Sage (Salvia coccinea) and Cardinal Flower (Lobeia carinalis) and other nectar-bearing plants are excellent sources of quality food. Likewise, if hummingbirds find that your birdfeeders are a reliable source of high quality food, they will visit your feeders more often. It's as easy as that! - FRESH - the newer the nectar, the better. Never cloudy, never containing mold. Even in my northern clime, I've been trying to change my nectar every 2-3 days. - CLEAR - with no artificial dyes. Just a plain sugar and water mix that most closely mimics flower nectar. Read 5 good reasons to NOT use red nectar. - CLEAN FEEDERS - no mold inside or in the hard-to-reach ports. If your hummingbird feeder is hard to clean, get one that is easier to clean and guess what? You'll clean it more! Good for the birds, and good for you when you get to see MORE birds!